I hesitate to even speak of this trip, as if in doing so will rob it of its essence, the unique place it occupies in my mind. But I started this blog to share experiences and this trip potentially spilled into the life altering category, so here i am. It began like all good trips do - with a photocopied Michael Kelsey map and some emailed beta - thanks Whit and Doom. It should be stated from the outset that I harbor an intense and irrational sorrow for the loss of a landscape I never knew. It is nothing but a mental construct of a place, but its hold on me is rather strong. Because of it, I I began this trip with an altogether deeply seeded negative bend. I was worried about getting attached to a place only to see its life slowly snuffed out by an ugly and irresponsible legacy. But that was/is not the case. Heraclitus stated that no man ever steps in the same river twice, for it's not the same river and he's not the same man. This trip has changed me in subtle but powerful ways. When I say life changing I simply mean an alteration of a perspective that I once held as absolute truth. After months of planning and obsessively watching the saw tooth wax and wane of the hydro-graphic table, obsessing over 5-10 CFS, it is an incredible feeling to finally be floating. But the floating doesn't last long, and soon the reputation of the river becomes a reality. We exit our boats and begin the first of many drags. Photographing is difficult. The river requires constant attention to try and avoid sand bars. At one point camera meets water, frustration ensues, and we pull over for a beer break. The camera, water spilling out of its lens-housing, somehow survives. I decide I need to be more selective with my photography and stow it away in a dry bag. We finish our beers and push on. The character of the river begins to change. Canyon walls grow larger, sheerer. 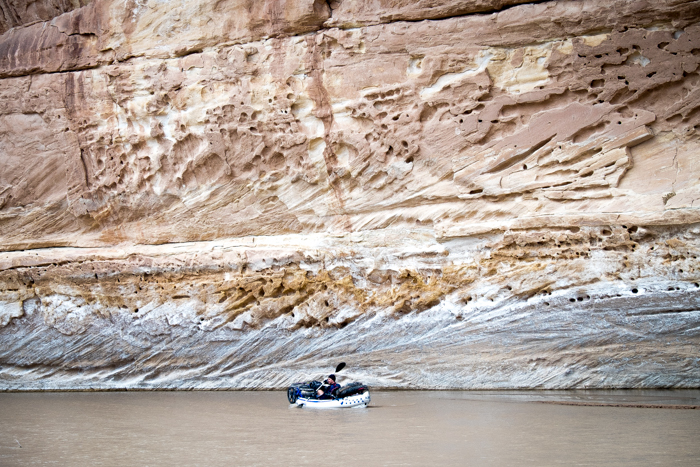 At one point we round a bend and see a massive sandstone wall on river right that forces us to stop. Chad, an artist, see www.moabart.com has brought his tools and cant pass up the inspiration. Boat side art creating commences. We make a few more miles before coming to camp. Both Chad and I are still very weary of the flows and in the morning my travel companion lets me in on some startling information. Apparently he awoke in the middle of the night, audibly disturbed he could actually hear a river gasping for its life. The change in timbre is evidenced the next day as our river appears but a shadow of her former self. Day 2 is long and against a fierce headwind. We eventually grow weary of the winds and find a choice sheltered ledge camp and decide its too good to pass up. We huddle under a protected sandstone lip, partaking in ample gin and tonics, eating and philosophizing into the night. The next morning the weather changes for the better and we decide almost at the exact same time that a layover is just the right thing to do. Chad takes off, pastels in pack and I hang back in camp to read, write, and photograph. In the morning we move on, our destination Happy Canyon where we will reconnoiter with friends who've biked in via the Black Jump. The river has come alive at this juncture. Miles are easily made. We have a rough meet up time for noon. Chad and I pull into Happy around 10:30 and decide to go for a mellow stroll. More art is created. Once back outside the enclosed depths we meet up with friends who’ve biked in from an old jeep road winding atop a Shinarump bench high above the river. Hugs and handshakes are doled out as we greet one another. The bike group is generous and has brought (still cold) bratwurst, gin and tonic water. Luxury! Camp is erected and a fire built. Chad and I speak of our travels over the last five days, and as day slides into night someone pulls out a vintage second edition copy of “The Book.” Abbey’s Desert Solitaire. We decide it is a good time to pass the tome around the fire, slinging passages into the star filled night. When my turn arrives I can’t help but be influenced by my perception of what lies downstream. I know that in a few days we will be passing through a war zone. I imagine a free flowing river slowly succumbing to a slackwater burial. With sorrowful inflection I choose my passage, a boilerplate summation of my solemn emotive state. In the morning we press on, our fleet of two now expanded to six. I'd heard from several sources that we should forgo the section below Poison Spring because the river corridor is ugly and becomes "like an irrigation canal." We take our chances and find the reality to be anything but. In the morning we say goodbye to our friends who must take out a day earlier than us. Chad and I are both brutally aware about what awaits downstream. 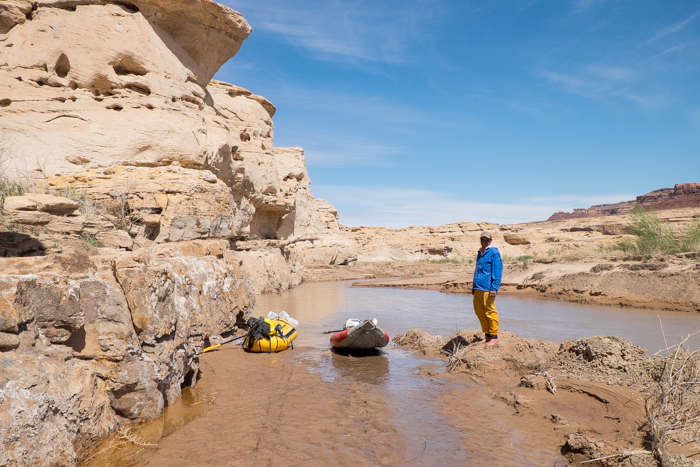 The lowest portion of our trip bears the scars of Lake Powell - steep sediment embankments and forests of tamarisk. We revel in what is still pure and decide to do some exploring. 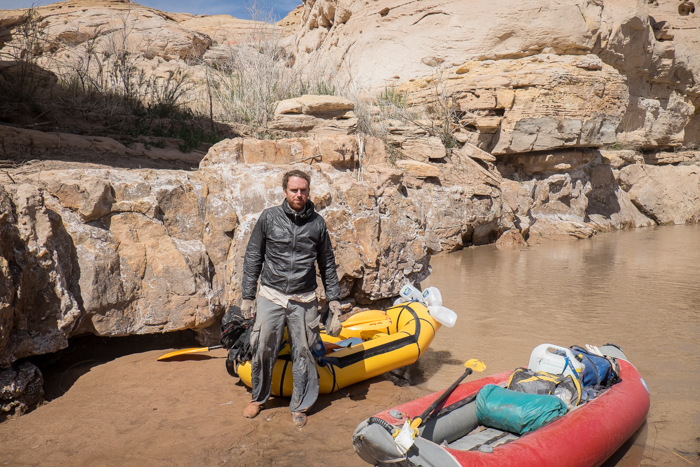 Chad decides to walk up river as I follow a long sandstone veranda downstream until it comes to an end. The section we travel is particularly alluring. We eventually get on the water but make camp in the early afternoon, tired of battling the strongest headwind we have yet faced. Crossing the transition zone camping becomes limited and requires steep sand dune walking, but we find a sheltered overhang and spend the afternoon waiting the storm out. That night, as the winds taper off and our world becomes still we climb up above the river and I get a new view of the destruction caused by that wedge of cement near Page. Massive sediment beaches are infested with dense thickets of tamarisk. It is a humbling view. 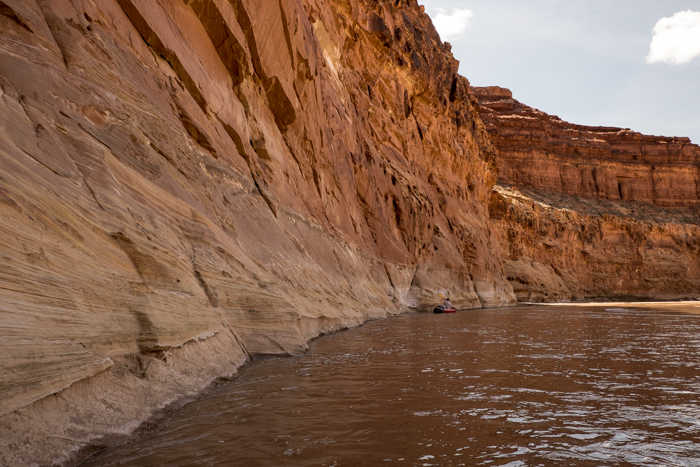 I tend to stay well away from Lake Powell and its immediate periphery - the landscape always seems overwhelmingly emotive in a negative way - this was the first time I had actually passed through the transition zone, where one era gave way to another. But that night, under a sandstone ledge our world becomes so still as to heighten our senses and I hear something that affects me deeply. All around me I hear splashing as piles of back filled sediment calve into the river. We sit and take it in - the voice of a river reclaiming herself. The beauty here is still staggering. I did not expect this - in fact it is a direct contradiction to a belief I have held for so long so strongly. The mental construct of a place, removed from personal experience and bolstered by a fiery rhetoric can take hold in one's heart and soul. The place I envisioned was not at all the place I found. The river was far from dead, there is astounding beauty where I had once imagined only ugliness. As the day progresses and we enjoy the final miles of our trip, the sounds of a living world invade my senses. Birds call out as the river undercuts steep banks of sediment, taking once firmly rooted tamarisks with it. In some places the flowing water has cleaved away any remnants of back-fill as sheer sandstone walls bleed with the lifeblood of this place. In a word, it is inspiring and I find myself exasperated at the error of my views. A few nights prior, I recited a particularly negative passage from Solitaire, Ed's words giving meaning to how I felt and what I thought I knew. But his generation differs substantially from mine - especially when it comes to this place. I will never know the Glen as he did. Abbey's best work was done at the precipice of loss. His most vitriolic passages were those ascribed to that sentiment which was responsible for the flooding of the canyonlands of south central Utah. 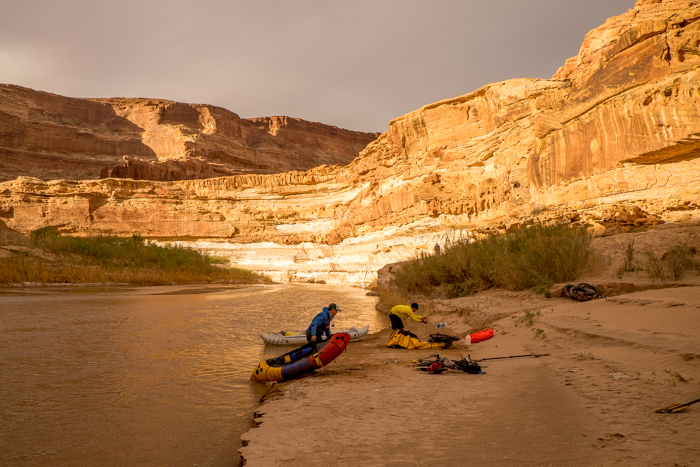 Lake Powell became the edifice upon which he erected a new land ethic; one of reactionary eco sabotage that connected with a whole swath of armchair environmentalists. Rippling across generations, the haunting tide of Abbey’s voice surges deeply in my soul. But I am a generation removed. My attachment is irrational. I never knew the Glen as he did and I never will. Whats easy is to sit around and lament about what has been lost, to cling hopelessly to the past. To be hopelessly sentimental. The west needs a new sentiment. A more optimistic future oriented view. We need to let go of the realities of yesterday, substituting instead a more balanced view of tomorrow. To be sure, this is not a naive apathetic view, but one born more of hope than loss. It is aware of the distant drumming of the next battle already on the horizon, but it recognizes that there are places that we label as lost that are actually healing. Anyone who's read the Monkey Wrench Gang knows this bridge well. Chad gives the obligatory salute. 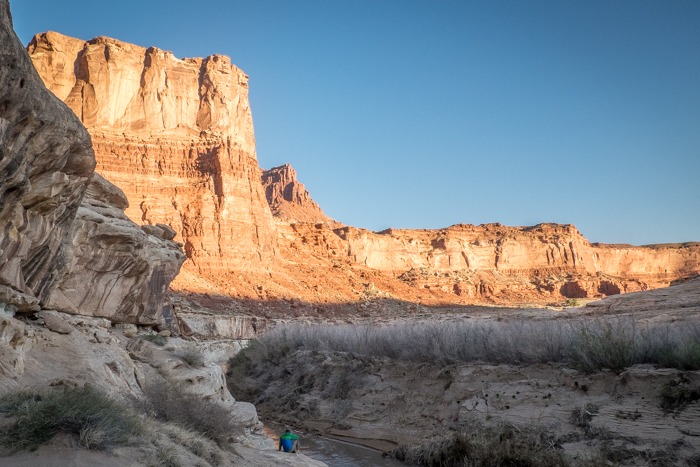 After a deeply introspective 8 days we pack up and head back to Moab. I stand in the shower watching the drain slowly clog with a filthy mix of sand and mud. It is time for the costume change. I scrape my dulled razor across the whiskers now sprouting on my face. Off come thick masses of 8 day stubble congealed in a gritty ointment of windswept sand. The transformation is complete, I am now ready to re-enter the portal to my work a day life, reflecting expected professional aesthetic trappings. I hate the title hopeless optimist. Word association is a powerful thing. To ascribe a viewpoint that fundamentally disallows any chance of a tangible reality is a bit too nihilistic and apathetic for me. The world already has more than its fair share of both realities. I prefer eternal optimist because it touches on geologic time, and geologic time is the wellspring of hope that I drink from. Abbey’s fiery rhetoric was born out of an unseemly reality, in a word, Loss with a capital L. The misnomer of economic progress and the resultant legacy of Abbey’s words loom large on the desert Southwest. But there are people fighting this legacy. I have met one. She is wild and she gives me a new found sense of peace.